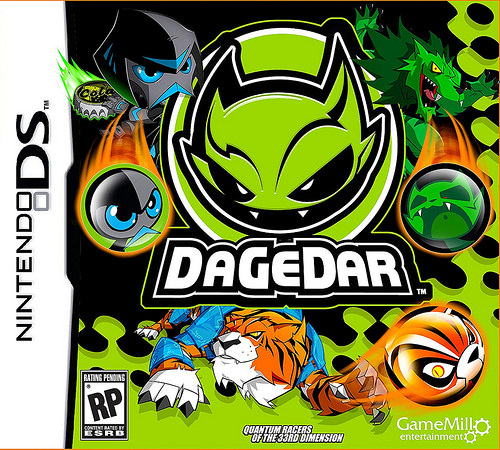 It’s time to look at a very obscure racing game known as Dagedar. I’ve had this one on the backburner for a very long time because it was just hard to get into the game. I couldn’t even beat the first level for a super long time. It doesn’t help that the only way to clear a level/tournament is to win at least 3/5 races. The game doesn’t really help you out with learning the controls so that’s something you’ll need to figure out on the fly. Interestingly it’s the kind of game that gets easier as you play it since you just need a fast car in order to win. It had a very shaky start, but I suppose it was okay by the end. So there aren’t too many modes to play in this one. You can jump into the Grand Prix adventures or go to Time Attack. I believe there is also a multiplayer option but good luck finding someone else who has the game. Time Attack can be fun if you want to train and it also helps you unlock Dagedar along the way. I was able to unlock one by beating one of the levels which helped me go back to the Championship. Naturally the championship mode is where you will be spending most of your time as you aim to become the best of the best. There are 7 tournaments which each have 5 races so that’s a lot of track to cover. Technically each stage is only around 2 minutes long so you could theoretically beat the game in less than 3 hours. However, as I mentioned the game is extremely difficult. It probably took me about 5-7 hours just to beat the first tournament. I had significantly less trouble with the other tournaments. They finally got tough again near the end, but by then I had played enough of the game to have a pretty good idea of what it was all about. I had taken the game to the brink of what it could offer me. The levels also started to become pretty similar by then and the only way it could get tougher was to mess with the tracks. Eventually they would start reversing or you would have to do very precise jumps. Mess one up by hitting the electricity and catching up to the other car would be nearly impossible. Lets backtrack to the gameplay real quick. You move by moving the control pad of course and you can jump with the B button. You also have access to a boost button which you get from orbs in the road. I recommend using them for the big wheels you have to enter like the song games as the extra speed will make them a breeze. Once you get a fast enough car as long as you play well victory will be guaranteed. That’s where the tight turns and such come in. At the end of the day it will all be about your fundamentals and how good you are at the stage. Just try them out in Time Attack until you’re comfortable enough to win. Since there’s no story mode or anything like that I didn’t feel much pressure to do so, but if you really want to prove yourself then this is a good game to do so. I suppose the game does have a good amount of replay value though. You could easily get 10+ hours in this game trying to get all of the Dagedar and clearing all of the tournaments. If you take to the gameplay better than I did you could certainly clear the game quicker, but don’t underestimate the difficulty level of this title. It’s not the kind of game that you can just pop in and clear with your eyes closed. It will definitely take a lot of skill and finesse to get the job done here. It’s a good challenge though and one where practice is rewarded. Overall, Dagedar is one of those racing games that takes a lot of time to really get going. At first your car is simply too slow and the computer goes through the course almost perfectly. In fact, I’d argue that the A.I. plays at the same level for all tournaments. The only difference is that once you get a car that is faster than the A.I.’s it no longer matters quite as much. Don’t worry about the control stat since it doesn’t matter much and just go for pure speed. As long as your reaction times are on point you will then be able to blow your opponents out of the water. You’ll also enjoy the game a lot more. If you can find this game for a few bucks then it’s worth taking the plunge. If not, just buy a better racing game like Mario Kart that also has a lot more replay value. This entry was posted in 7 Star Games, Game Reviews, Games, Reviews and tagged Cars, Dagedar, DS, Game Review, Nintendo, Racing, Review, Video Game Review by dreager1. Bookmark the permalink.